Abstract : Southwest China's Chongqing municipality on Monday announced ten credit-building model cases in Banan District's Huaxi Live center, also initiating a week-long event for promoting credibility and integrity across the city. 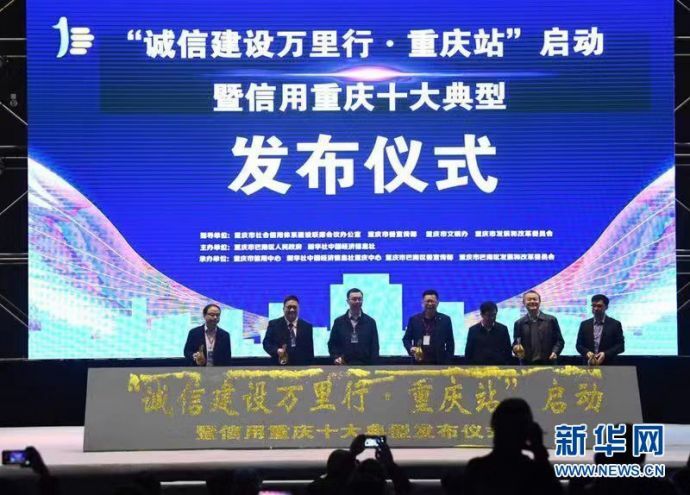 BEIJING, March 19 (Xinhua) -- Southwest China's Chongqing municipality on Monday announced ten credit-building model cases in Banan District's Huaxi Live center, also initiating a week-long event for promoting credibility and integrity across the city. The ten cases, selected out of 126 candidates and including "combining credit and tech for cracking financing difficulties for small and micro enterprises" by China Construction Bank Chongqing Branch and "building a brand of creditability for transnational economic and trade cooperation" by Chongqing Foreign Trade and Economic Cooperation (Group) Co., Ltd, aim to act as role models to further spread credibility culture as well as create an integrity and credit upholding environment. The day also witnessed the initiation ceremony for Chongqing municipality to carry out city-wide credit building and promotion activities during March 18-24 in efforts to expedite credit construction and make Chongqing better recognized as a credit city. Credit Makes Chongqing Better Summit as well as Credit Chongqing Construction Results and Credit Product Exhibition were also held along with the initiation ceremony. In addition, Chongqing will carry out more industry-based credit construction activities across sectors such as property, decorative building materials, finance, real estate as well as trade circulation throughout April to December. Special activities such as industry surveys and investigation, problem collecting and rectification, industry development seminars and industry credit index system building will be conducted to strengthen credibility and responsibility senses across enterprises and industries, while advancing industry credit information platform construction. It is noted that the credit city building activities will get support from China Economic Information Service (CEIS) through its credit arm "Xinhua Credit".